Electron-neutrinos and muon-neutrinos of atmospheric origin are produced from pion decays and subsequent muon decays, which occur when high-energy cosmic-rays enter the atmosphere of Earth at about 15 km from its surface. They are detected in Super-Kamiokande, a 50,000 ton water-Cherenkov neutrino detector located deep underground in Kamioka, Gifu. Neutrino-induced electron and muon events are observed by detecting Cherenkov photons using 11,200 photomultiplier tubes instrumented in all of the inner surfaces of the water tank. The left- and right-top panels show typical hit patterns of an electron event and a muon event induced by the neutrino interactions observed in Super-Kamiokande, respectively. In these views, the cylindrical detector is opened to flat. The colors indicate the timing of photon detection for each photomultiplier tube. Each event pattern determines the species, energy and direction of the neutrino. The three bottom panels show the zenith-angle distributions for multi-GeV muon-neutrinos. From left to right, they show 1994 data from Kamiokande, 1998 and 2009 data from Super-Kamiokande. As the number of events accumulated increases year by year, a greater deviation has been revealed of the observed distribution from the expectation without neutrino oscillation. The black or blue histograms show the expected distributions for non-oscillation cases. The red histograms show the best fit neutrino oscillation. 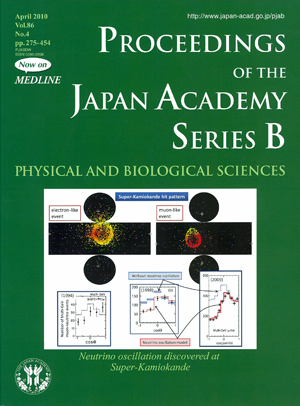 Detailed studies of these neutrinos events led to the discovery of neutrino oscillation, and thus of tiny neutrino masses, as described by T. Kajita in this issue.